At www.exclusively-cyprus.com you can find a variety of holiday villas in the village of Pissouri and at Pissouri Beach. We offer a wide range of properties, showing full details of each villa - including up to date availability of each one. There is also information on restaurants and tavernas in and around Pissouri; and the Cyprus Information page updated to include public holidays as well as the weather. Television Many villas now have an internet connection and provide streamed UK TV - where this is the case there is information about it on individual villa pages. The bedroom a/c units are NOT limited to 2 hour timed periods - as is in many villas. See also the availability page to check for other last minute availability. Exclusively-cyprus is now in its 14th year of offering villas to rent in Cyprus, and the owners have over 37 years of experience of Cyprus. There are many beautiful places in Cyprus with villas, but we specialise in villas and apartments in the delightful village of Pissouri. The Cypriot village on the hill is coupled with the nearby community of Pissouri Beach to offer villas near the sea and its Blue Flag beach, or villas in or close to the friendly and traditional village. Most of our villas have their own swimming pool, and most of the villas that don't have shared access to a nearby pool. Our range of luxury Cyprus villas, with details of availability, should enable you to find the perfect holiday in Cyprus. For more photos see our archive of photos of Cyprus. CD of high quality pictures of Cyprus now available. Click here for more details. If you would like more information on Pissouri or conferences in Cyprus, if you would like to advertise your villa in Cyprus or apartment on this site, or if you have any comments, please email us at pissouri@exclusively-cyprus.com. Exclusively Cyprus is a UK-based Cyprus villas agent and Cyprus villas specialist. 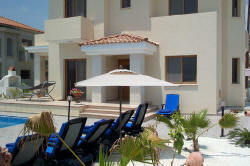 A United Kingdom company offering Cyprus villas to rent. Exclusively Cyprus for villas in Cyprus.